I created this free-hand pencil sketch custom portrait drawing In Memory of “Harley” Super Dog Pet Portrait. Starting with a white blank piece of paper is a daunting task to start with that first pencil mark. I mapped out her nose and eyes and the distance between the to carefully drawn them in. Harley’s nose was not black more medium brown, her fur was a gold blonde. Penciling in the tones to make sure her fur and nose tones represented with that feeling of gold blonde fur. Harley’s eyes were very dark brown. She drew you into her beautiful face with the expression of her eyes. 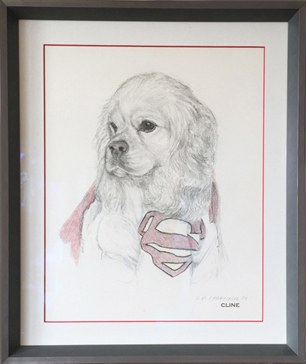 This pet portrait painting art commission definitely captured this “Harley” Super Dog Pet Portrait. We use to dress her up on Halloween in this costume “Super Dog”. She was the sweetest most loving Cocker-Spaniel ever. Once I captured her eyes and nose I felt her spirit. To this day when I look at this “Harley” Super Dog Pet Portrait drawing I look right into her beautiful loving eyes. 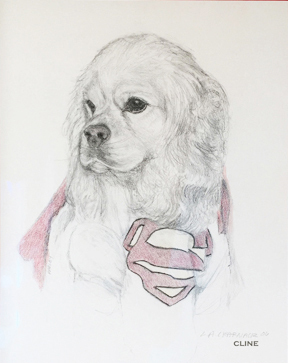 I am so happy my husband to be at the time commissioned this portrait of his “Harley” Super Dog Pet Portrait. I am so happy to have this portrait “Harley” Super Dog Pet Portrait on my wall. Seeing her every day brings such happiness to our family.